Here are three very different ways to invest in the unstoppable trend towards creating and analyzing massive data collections. "Big data" is one of those buzzwords that just won't go away. Search interest in the term started gathering steam in 2011 and remains on a roll today. We have covered the field in nearly 2,000 articles here at The Motley Fool. The big data concept will only grow more important over the next few years. This would be a great time to start investing in this exciting space, and I'll show you three fundamentally different ways to go about doing that today. Here's how Tableau Software (NYSE:DATA), IBM (NYSE:IBM), and Hewlett Packard Enterprise (NYSE:HPE) can get you started in big data investing. Since Hewlett-Packard Enterprise parted ways with sister company HP Inc. (NYSE:HPQ) in November of 2015, the business-to-business technology specialist has rewarded investors with a 57% return. For the same period, the S&P 500 benchmark gained just 11%. And a large chunk of HP Enterprise's early success rested on the company's sharp big data focus. The idea of collecting, storing, and processing massive data collections permeates this company's operations from head to toe. HP Enterprise builds, installs, and maintains the hardware you need for designing a capable big data workflow. The company also covers the software required to incorporate big data concepts in your business, along with all the consulting services you need. If that weren't enough, management is investing even more resources in the big data space. The recently acquired network security specialist Niara, for example, uses data collection and analysis to identify and block advanced network attacks on the fly. Big data is a stated focus point for HP Enterprise, alongside the closely related data security and cloud computing markets. This strategy has worked wonders so far, and there's nothing wrong with betting that an established winner should keep on winning. IBM's Watson IoT center in Munich, Germany. Image source: IBM. IBM starts with big data everywhere, in the same vein as HP Enterprise. Then, the company takes the next logical step and uses this concept to build and power an even more progressive platform. Meet IBM Watson, Big Blue's artificial intelligence engine. Designed to pull actionable conclusions out of very large data sets, Watson is just about the closest thing we have to a computerized version of human intuition today. The system is set up and curated by human experts at first, and then continues to improve its cognitive processing models when new data is introduced. The more work Watson gets to do, the more it knows about that particular field. It's like training a human to become an expert -- hard work is rewarded with improvement. So Watson processes big data sets, using rules and connections learned from previously digested data sets. Big data begets more big data, preparing Watson to tackle increasingly large and complex problems. Three months ago, IBM kicked its Watson game into high gear. The company reorganized into five reporting segments. The brand new cognitive computing and industrial services division accounted for 43% of IBM's total sales in 2016, and 52% of its operating profits. This reorganization was done to assist IBM's "ongoing transformation to a cognitive solutions and cloud platform business." In other words, IBM is all about cognitive solutions these days, which puts Watson right at Big Blue's operational core. That's a solid commitment to harvesting, processing, and analyzing big data from every possible angle. It's important to note that IBM's strategic makeover has come at a cost. Top-line sales have suffered in recent years, and IBM investors have missed out on a 67% market rally over the last five years with a negative 15% return over the same period. In my view, the stock is selling at a generous discount for all the wrong reasons -- IBM is actually setting itself up for a leadership role in the next era of business computing. And it's all thanks to a firm commitment to big data. If IBM shares look cheap right now, you ain't seen nothing yet. 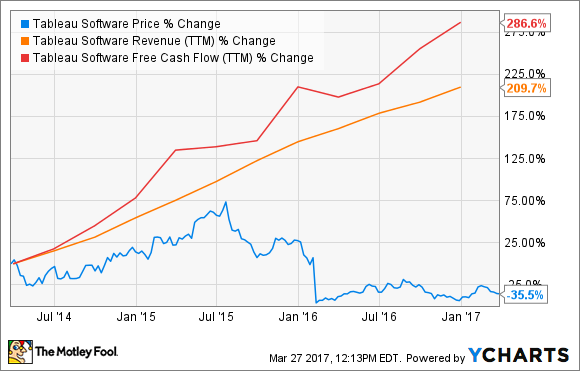 So Tableau is still trading at a generous 47 times trailing non-GAAP earnings, but both sales and free cash flows are growing at an annual clip of 23%. Tableau is tapping into the analysis side of the big data trend, and to good effect. This is the kind of stock that deserves a growth-powered price premium. Now, it is true that Tableau has nearly doubled its sales year over year as recently as 2014, and that the company's revenue growth has consistently slowed down since then. Investors are currently betting that the top-line growth line will continue to move downward. Intense competition from larger tech titans supports that view. Then again, two of Tableau's closest rivals have gone private and seem less interested in competing for this company's client contracts these days. And Tableau itself is revamping its sales and marketing operations in order to earn a larger slice of the enterprise-class data analysis market. So Tableau is responding to a dynamic business environment in a credible way, and could very well reignite the old fires under its sales and profit growth again. If so, the stock would have a long climb ahead of it. This is a riskier bet than HP Enterprise or IBM, but perhaps a more rewarding one -- if you don't mind a bumpy ride to that final destination.